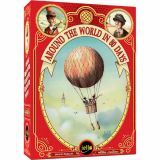 Based on the beloved novel and movie, players bet they can circle the world in 80 days – then alternate between strategies that are cautious and ambitious. Families will find this especially fun and challenging. For 2-6 players. 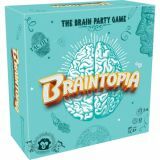 For ages 10 yrs-adult, from iello. How long can you keep that balloon in the air? This set is jam-packed with ideas to challenge kid's skills and reflexes. 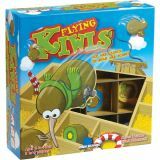 Fun for solo or teams, it packs neatly in a portable storage box for no-mess, no-fuss play! 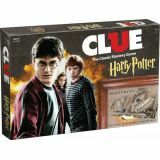 For ages 5-10 yrs, from Schylling Toys. It's powered by fingers and rubber bands! 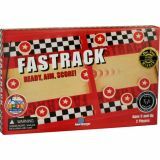 A fast-paced, wooden, tabletop action game challenges players to shoot 10 discs through the slot in the middle. The drawstring pouch makes it portable. For 2 players. For ages 5 yrs-teen, from Blue Orange Games. Here's the scoop. 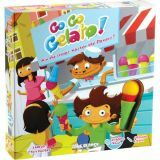 In this fast-paced dexterity game, players race to fill the customer's order exactly – but don't touch or drop the cones! 54 challenge cards + 16 cones + 12 scoops = a yummy good time. For 2-4 players. 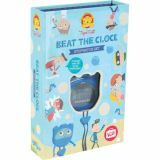 For ages 6-12 yrs, from Blue Orange Games. 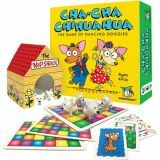 Get those dancing doggies cha-cha-ing on the dance floor – or they'll go straight to the nap shack! A silly, quick, no-reading-required game, where the top dog becomes ch-ch-champ! For 2-4 players. For ages 4-8 yrs, from Ceaco. 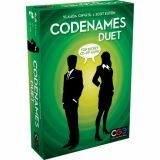 You and your partner must contact 15 secret agents, giving each other word-clues to help identify them, all while avoiding a band of enemy assassins! 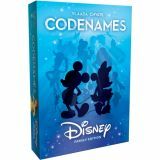 The 200 new clue cards are compatible with the original Codenames word game. For 2-8 players. For ages 11 yrs-adult, from Czech Games Edition. Only 1 spymaster from each team knows the real identities of 25 agents. 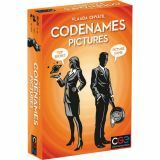 Their teammates know the agents only by their CODENAMES, and the race is to make contact first. The clues are cleverly-drawn pictures instead of words – and everyone should avoid the assassin! Multiple award winner. For 2-8 players. For ages 10 yrs-adult, from Czech Games Edition. 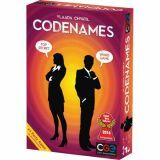 Only 1 spymaster from each team knows the identities of 16 secret agents, and the race is to make contact first in this award-winning game. This version features Disney characters and locations from the last 90 years. For 2-8 players.